Standing at 3-and-a-half feet in a Chicago apartment, the UT Tower stands tall. Not far in a guest bedroom lies a 2-and-a-half foot tall Darrell K Royal-Texas Memorial Stadium. UT alumnus Drew Finkel created these two campus landmarks out of more than 62,000 Legos combined. After posting pictures on Reddit of his Lego replicas of the Tower and the stadium, Drew’s hobby went viral. When the University tweeted a link to pictures of the stadium replica, Drew replied that UT was welcome to borrow it. According to Laura Finkel, Drew’s wife, the University jumped at the opportunity. Exactly when the stadium will be brought to UT and where it will be displayed has not been confirmed, but Drew believes it will be in the Student Services Building. Drew started the Tower, which took about five months to complete, in March 2013 and started the stadium this year. In the past, he had only worked on small, 4-inch tall Lego replicas of landmarks such as Big Ben, which had instructions. According to Laura, it is not unusual to want to stay inside when it is minus 14 degrees Fahrenheit. Drew used images from Google Maps to build the Tower and traveled to campus during spring break to take his own pictures, filling in the holes for any views he did not have. For now, when people visit his apartment, they are surprised to see Lego replicas. Drew’s friend Richard Meth, software engineer and UT alumnus living in Dallas, saw most of the process through pictures and when he visited Chicago. In front of an orange-lit UT Tower, 8,686 students graduated from the University at the 131st Spring Commencement ceremony on Saturday. The event capped off two days of ceremonies held in the individual colleges and schools at UT. University officials estimate 25,000 people attended the final event, which was held on the Main Mall. “If take you take some risks, step up when the times are toughest, face down the bullies, lift up the downtrodden and never, ever give up – if you do these things, then next generation and the generations that follow will live in a world far better than the one we have today,” McRaven said. During his speech at the ceremony, President William Powers Jr. praised the graduating class' diversity. According to Powers, the graduating class consisted of students from 71 foreign countries and 48 states. Powers said the University benefits from having students with diverse backgrounds. “Size and diversity are among are University’s strengths,” Powers said. Four-year graduation rates for the class of 2014 were not available by the time of publication. In 2011, Powers created a task force with the goal of improving the University’s graduation rate to 70 percent by 2016. Over the past five years, graduation rates have ranged between 50 and 52 percent. Along with seating on the Main Mall lawn, attendees could view the ceremony from nine indoor locations across campus, such as the AT&T Conference Center, Hogg Memorial Auditorium and Student Activity Center. After the ceremony, biochemistry graduate Ifran Nathani said he will miss the friendships he made at UT. The loudest noise on the 13th floor of the UT Tower is the minute hand of an old clock. More than half of the floors of the UT Tower are empty, classified formally by the University as either “vacant” or “future storage space.” Furniture and unused computer monitors are the only occupants in some of the abandoned offices. The few employees who still work in the upper floors of the Tower won’t be there much longer, because of safety concerns involving evacuation policies. 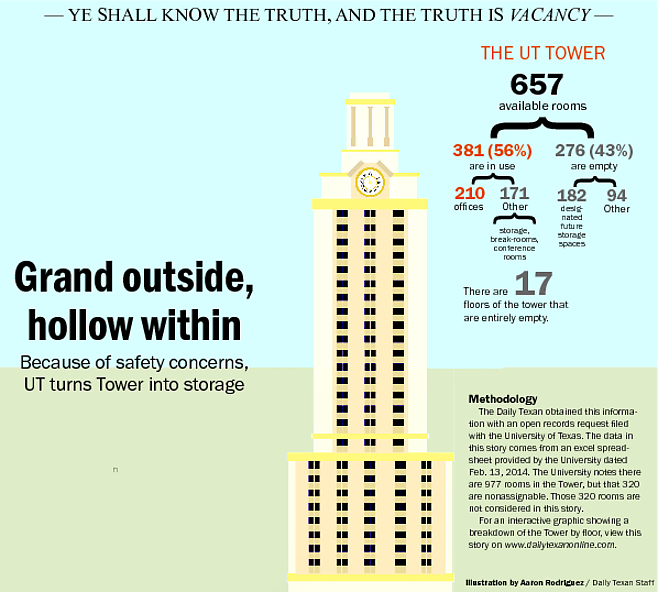 Though the outside of the Tower is ornately decorated, and instantly recognizable, UT’s most iconic building is largely hollow. Of the 657 available rooms in the Tower and Main Building, only 57 percent are currently in use. Of those rooms, just under half are not occupied by people and are instead used as break rooms and for storage. Seventeen of the Tower’s 32 floors are unoccupied. Though UT fire marshall James Johnson said there are several ongoing projects to make the Tower and stairwells more safe in the event of a fire, he does not feel those measures will ever be sufficient. Repurposing buildings is a standard practice on campuses as old and sprawling as UT. Waggener Hall, for instance, originally housed the business school, and as a result, is decorated with images of peaches, cotton, oil and other Texas exports. Waggener Hall became home to the classics and philosophy departments after the business school got a new building. Though buildings are regularly repurposed, especially for reasons of space efficiency, it is unlikely the upper levels of the Tower will ever become permanent office space again. office space. UT historian Jim Nicar said while a few administrators were using space in the Tower from the beginning, the plan was not to keep the administrators there but rather to move them into a building of their own. 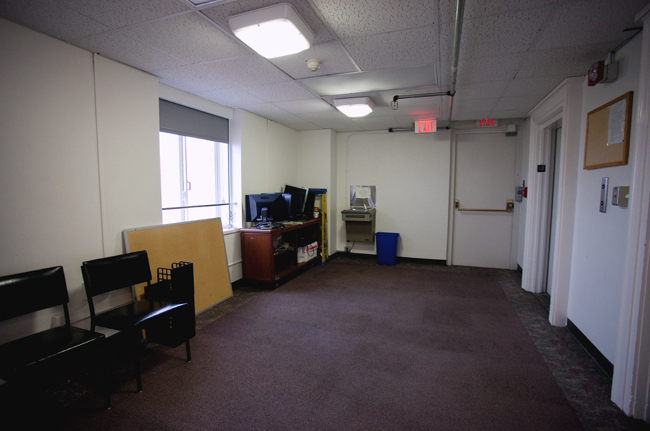 As more libraries opened up on campus, Nicar said the Tower began transitioning more and more into an office space for the administration and staff. Slesnick said UT does have plans to use at least some of the space, including using it to store plants. Slesnick says the University is still determining how it will use the upper floors of the Tower once everyone is moved out, but one option is to move storage of plant specimens from the Plant Resources Center currently spanning six lower floors to the higher space. The Plant Resources Center is the University’s herbarium, with more than a million plant specimens, including the largest collection of Texas plants in the world. Slesnick said moving the center higher up would open lower floors up to office space. Slesnick said transforming the space currently used by the Plant Resource Center into office space will take both money and time, and the process is further complicated by the fact that the Tower is an old and historic building the University strives to preserve. Students from UT's College of Communication put up their horns and scream after college dean Rodrick Hart announced they were official graduates. Under the burnt orange glow of the UT Tower, thousands took their seat as students. They stood up as UT alumni at the University’s 130th commencement Saturday. UT officials estimate 25,000 people came to see the 8,358 students from the Class of 2013 graduate. Sanya Richards-Ross, former UT student and Olympic gold medalist, delivered the keynote address at the ceremony, which UT officials have been planning for all year. The class’ graduation rate, a report UT officials consider crucial, was not available by press time. UT is leading an effort to increase its four-year graduation rates, which currently stand at 52 percent, to 70 percent by 2016. Attendees also faced new security standards and were unable to take any bags larges than 12 inches into the ceremony, a precautionary measure UT adopted after the Boston bombings. Richards-Ross told the crowd about the successes and failures she had experienced in her running career. She was diagnosed with a rare disease that gave her mouth ulcers, which she said made it difficult for her to run. Richards-Ross said she pushed through this obstacle to do what she loved and urged graduates to do the same. UT President William Powers Jr opened the ceremony and conferred degrees at the end. He said this year’s graduates came from 66 countries, 48 states and 158 Texas counties. Rod Caspers, director of University Events, said his office began physically setting up for graduation in April. Hundreds of people are brought in to replant flowers, paint the streets and set up chairs, among other tasks. There are six immediate staffers in his office and more are brought in to help with graduation. Many of UT’s events are volunteer-based, he said. About 65 people signed up to volunteer at graduation. Caspers said people could watch the ceremony in front of the UT Tower or in any of the nine indoor viewing locations across campus, including the Student Activity Center and Hogg Memorial Auditorium. Many go there to avoid the heat, he said. “It’s kind of like we’re inviting family and friends to our house. You don’t invite family and friends if you don’t have enough food,” Caspers said. “I don’t want people to have a bad experience because we didn’t plan for it. UT officials said last year 52 percent of 6,679 first-time freshman who came to UT in 2008 graduated in four years; 324 were dismissed; 871 dropped out and 2,000 continued onto a fifth year. Officials said final numbers would be available in the fall. Event personnel checked bags at all entrances to the weekend’s graduation ceremonies. UT spokeswoman Tara Doolittle said the University prohibited bags larger than 12 inches to be brought into the ceremonies and all other bags would be checked. She said UT worked to inform graduates of the change. Chemical engineering graduate Rebekah Scheuerle said she appreciated the opportunity to work in a research lab during her time at UT and network with the school’s most talented students. Philosophy graduate Paulina Sosa said she felt the social experience of studying on campus and interacting with various student communities, studying abroad in Italy and being involved in UT’s entrepreneurship program have changed her life. Contact Christine Ayala christineayala@utexas.edu or follow her on Twitter @christineayala. Additional reporting by staff writer Jody Serrano. The glow of red candles illuminated the steps of the UT Tower 71 years after UT’s first hex on Texas A&M, proving that Longhorn tradition remains even if the original opponent does not. The Texas Exes Spirit and Traditions Council hosted its annual Hex Rally on Monday at the Main Mall, placing a curse on the TCU football team in time for the Thanksgiving game. Although the Longhorns have hexed A&M for the past 26 years, the Aggies’ departure from the Big 12 Conference provided UT with the opportunity to hex the Horned Frogs. According to the Texas Exes, the Longhorn football team ended an 18-year losing streak against A&M at Kyle Field in 1948 after a local fortune teller, Madam Agusta Hipple, suggested burning red candles a week before the game. Since then UT has used the hex against rivals other than A&M, including SMU in 1950, Baylor in 1953 and TCU in 1955. Kelsey Roberts, the Texas Exes’ student relations coordinator, said the organization considered replacing the hex rally as a result of A&M’s departure, but ultimately decided to keep the rally because it is a valuable piece of UT history and tradition. Advertising senior Erica Flores, Texas Exes Spirit and Traditions Council chair, said the council worked to make the rally more UT-focused by introducing new acts to the rally, including a skit by mascot Hook ‘Em and a speech by Harley Clark, creator of the “Hook ‘Em Horns” hand sign. Flores said the organization successfully maintained student body spirit for the tradition. The Student Chapter sold more than 400 Hex Rally shirts Monday in addition to 400 shirts it sold Nov. 14, Flores said. She said this support reflects UT’s independence gained from A&M’s departure from the Big 12 Conference. “Of course there may be mixed opinions about the rally, but there is a sense of such excitement because not all campuses do these types of things,” Flores said. Despite the changes made to the rally, one aspect remained the same. Coach Mack Brown initiated the hex by lighting the first candle. Brown emphasized UT’s 15-home game winning streak against TCU. Junior offensive guard Mason Walters said UT’s opponent is not what is important. Walters said what matters is the time-honored tradition of Longhorn football on Thanksgiving Day. A student fills a gallon jug with dirty water from Town Lake on Friday Oct. 26. The Clean Water March represents the walk many people in developing countries have to make in order to supply their families with water. Carrying two gallons of water each, students trekked more than five miles from UT Tower to Town Lake to raise awareness about the approximately one billion people who are forced to walk miles for clean water every day. The walk was organized by Students for Clean Water, a student organization that works to raise awareness about water problems in developing countries. Nutrition senior Zabin Marediya, the organization’s president, said in some areas, children as young as 5-years-old retrieve water with jerry cans, which can hold about five gallons of water, or up to 40 pounds. According to the nonprofit organization water.org, 3.4 million people die each year from sanitation issues, including a lack of access to clean water. Children collectively miss up to 443 million school days due to water-related illness. Public health senior Jesse Contreras, Students for Clean Water vice president, said despite the fatigue, the walk was a positive example of doing anything possible to raise awareness for those in need of clean water. Students for Clean Water has raised more than $65,000 for clean water since its inception two years ago with efforts that include benefit concerts, a semi-annual pancake party and profit shares with local businesses. Students for Clean Water is currently working to provide the Rulindo District of Rwanda with clean water for the first time. In addition to university efforts, the organization advocates support for Austin initiatives for clean water. Some of the organization’s members participated at the Gazelle Foundation’s “Run for the Water” Sunday morning. The Gazelle Foundation focuses on improving the quality of life for those in Burundi, Africa by funding and building clean water projects in Burundi. Plan II junior Jaclyn Kachelmeyer, Students for Clean Water member, woke up early to run a 5k route for the race. She said although she was exhausted, she was glad to participate in the race because it was for a good cause. To see more photos of the graffiti, view Daily Texan photo blog: Aggie-themed graffiti litters campus. Even though UT and Texas A&M University are not meeting on the football field anytime soon, vandals sought to fan the flames of rivalry by defacing prominent UT landmarks with A&M graffiti tags this weekend. UT spokesperson Cindy Posey said the areas around the UT tower, the Peter T. Flawn Academic Center, and the East and West Mall were some of the areas tagged. Although University officials don’t know exactly when it happened or who is responsible, they guess that it was between Friday night and Saturday morning. Posey said an investigation by the University of Texas Police Department is underway. Officials started cleaning the affected areas Saturday and expect the cleanup to be finished soon. UT building attendant Christopher Goudreau said it will be a big job to clean up the graffiti because most of it was done with spray paint on concrete, but he thinks it is possible and there will be no need to replace any thing that was vandalized. Prominent UT landmarks defaced include the wall perimeter of the UT tower, the windows of the of the Peter T. Flawn Academic Center, the statues of Jefferson Davis and Woodrow Wilson in front of the tower and the 1987 “The West” sculpture by Donald Lipski that is East of the tower. Posey said she did not know what the consequences for the vandals involved would be. Similar vandalism attacks have occurred at UT in the past. In Oct. 2011, vandals spray painted a bridge near the Winshop Drama Building and other campus monuments with sayings that include, "GiG em Aggies." The Texas A&M football team joined the Southeastern Conference this fall, and they are not set to play UT this season for the first time since 1914. A rivalry between the two schools has existed since 1894, when they first began playing each other. Undeclared sophomore Emily Smith said she thought the graffiti was probably done to keep the rivalry between the two universities going, but she it wasn’t a good attempt at accomplishing that goal. Smith said although UT was defaced, she hopes members of the UT community will not retaliate against Texas A&M. “I think we should keep the moral high ground,” she said. The chime of UT’s carillon bells will soon be absent from campus as a three-month construction project draws closer. For the past four months, the bells have been in partial operation for a separate construction project. From Nov. 1 until Jan. 31, the carillon bells housed in the UT Tower will be out of commission for a $71,000 project to repair years of wear and tear, Bill Throop, director of project management and construction services, said. Throop said the bells have been in partial operation for the last four months because a $331,000 walkway was being built around them. He said the bells will resume normal operation Thursday and continue until the November project begins. Throop said he feels it is important for the University to preserve the bells, as they have become an integral piece of UT’s culture. “It’s just part of the fabric of the campus,” he said. Joshua Cook, spokesperson for the office of the vice president for Student Affairs, said the bells have a long history at UT. Throop said normally the bells go off every quarter hour. They chime the correlating number of times for each hour on the hour and once on the quarter, half and three-quarter hour. Also, tunes are played on the bells several times throughout the day by professional keyboardists inside the tower, Throop said. He said the University decided to build the walkway around the bells after receiving complaints from workers that the area should be more in line with current construction safety standards. Throop said while working on the walkway, and in recent years, the wear and tear on the bells became increasingly apparent, and repairs were deemed necessary. “More and more often, [UT staff members] were having problems with individual keys and individual bells,” he said. UT alumnus Nathan Crenshaw said he hopes the construction goes well and the bells last for a long time, as he is well aware of their importance to the campus community. The Longhorn Band performs at Gone to Texas Tuesday, Aug. 28. The annual event welcomed the class of 2016, which could potentially be the largest incoming freshman class UT has ever seen according to University officials. The number “16” burned brightly on the UT Tower at the 15th annual “Gone to Texas” welcome celebration. Traditionally held the day before the first day of school, the celebration featured speakers, special performances and an address from UT President William Powers Jr. To accommodate the large class of incoming students, university officials set up about 1,200 additional seats. The event also featured the UT Honor Code, which encourages values like learning and responsibility, despite Powers’ summer announcement that it would be changing within the next few months. Student body president Thor Lund opened the night with a few encouraging words for the new students. Every year, Gone to Texas welcomes all students new to UT, whether freshman, transfer or graduate students. Junior transfer student Bryce Gibson said it was a good way to start off the year for him. In addition to hearing from Powers, students were also encouraged to take advantage of all the opportunities at UT. Biology and anthropology senior Alexa Van Brummen spoke about her experience reaching out to a professor and getting involved in research her first year. Brummen works on spinal injury reseach and encouraged new students to get involved early in their time at UT.